Misbah-ul-Haq's superb run in the Champions League Twenty 20 continued, with the Faisalabad Wolves' captain scoring another half-century, to lift them to a 10-run victory against Kandurata Maroons in Qualifier 5, in Mohali, on Friday. Misbah hit a quickfire 93 from 60 deliveries, to help his team finish off with a consolation victory. They had lost their first two matches in the qualifying round to be knocked out of the running for a place in the main round, while Sri Lankan side Maroons went home after three straight losses. Sunrisers Hyderabad and Otago Volts have already made it to the main round from the qualifying group. Faisalabad’s bowlers put up a better performance than their batting counterparts. They did well to make early breakthroughs and then contain the opposition for a while. Ehsan Adil was at his lethal best, picking up three wickets for just 26 runs from his four overs. Maroon’s opener Upul Tharanga started out well but then Asad Ali came back strongly to dismiss the other opener Thilina Kadamby for a duck. Captain Lahiru Thirimanne became Adil's next victim. Milinda Siriwardana was Adil's last victim before Lokuhettige was unfortunately run-out. The scoring rate dropped and the overs were running out and the match eventually ended with Maroons making 136-7 in their 20 overs. Earlier, the Maroons opted to field after winning the toss and their decision was vindicated when Nuwan Kulasekara struck in the first over of the innings. Faisalabad opener Ali Waqas fell for a duck when he was caught behind by Kumar Sangakkara. The middle order also failed to come to the party as Faisalabad kept losing wickets at regular intervals. Maroons' paceman Dilhara Lokuhettige then joined the party as he accounted for three Wolves' wickets. His first victim was opening batsman Ammar Mahmood who fell for 10. Ajantha Mendis then trapped Khurram Shehzad leg before wicket for seven as Faisalabad slipped to 56 for four in the 10th over. 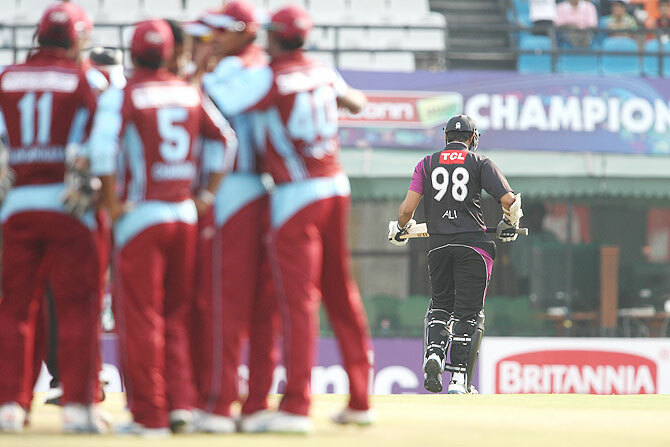 The lethal Maroons bowlers didn’t give the Wolves any recovery time, until the arrival of captain Misbah. Misbah joined forces with Mohammad Salman to put up a fight in the middle overs. Salman gave Misbah good company, scoring a run-a-ball, taking the singles and twos and hitting the odd boundary. Salman's entertaining innings (21 off 21) ended when he was caught by Lahiru Jayaratne off Dilhara Lokuhettige after he added 74 runs for the fifth wicket with Misbah to put their innings back on track. Misbah then played the lone ranger, punishing all the bowlers all over the park. He meted out special treatment to Suraj Randiv, who was whacked for 30 runs off 2 overs, to finish unbeaten on 93 from 60 balls, having hit six fours and five sixes.